The Indian Creek Valley Railroad is chock-full of rockwork scenery because the layout is a replicate of the mountains of Pennsylvania. The detail is incredible and the technique for creating model rock molds is impressive. Designer and creator Harry Clark spent countless years on his layout, and developed significant strategies for creating realistic rockwork scenery. In part five of the 9-part Indian Creek Valley Railroad series, Harry Clark reveals his technique for creating model rock molds and rockwork scenery. He begins with an authentic piece of coal, paints it with latex rubber, and later creates a plaster casting. In this video, Clark shows you how to create and set the casting. He also explains and demonstrates how to stain the rockwork. Four more episodes remain of the Indian Creek Valley Railroad series. 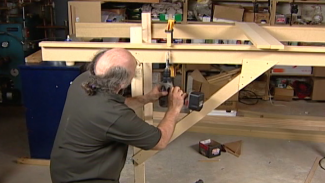 Harry shares tips on using natural material for scenery, demonstrates how to create and easy lattice look, provides a tutorial on creating a round house, and shows his technique on how to make windows. 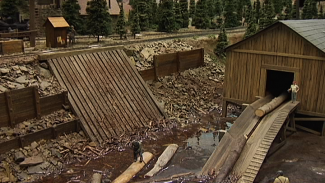 If you’re looking for more advice and guidance on specific model railroading scenery projects, several other model railroad experts share their tips for creating scenery as well. These useful tips will make your model railroading projects easier and you’ll likely learn a thing or two you didn’t know before.